On Friday, the transcripts of the Federal Open Market Committee meetings from 2008, the year when the financial crisis intensified and the economy collapsed. The Fed’s understanding of the crisis, however, was clouded by its reliance on indicators that tend to miss sharp changes in conditions. The government initially estimated, for example, that the economy expanded in the first half of 2008 because it basically assumed that some economic trends, like the pace of business creation, had continued apace. The Fed also relied on economic models that assumed the existence of smoothly functioning financial markets, limiting its ability to project the consequences of a breakdown. And the outlook of Fed officials also reflected a deeply ingrained bias to worry more about the risk of inflation than the reality of rising unemployment. As Fed officials gathered on Sept. 16 at their marble headquarters in Washington for a previously scheduled meeting, stock markets were in free fall. Housing prices had been collapsing for two years, and unemployment was climbing. Yet most officials did not see clear evidence of a broad crisis. 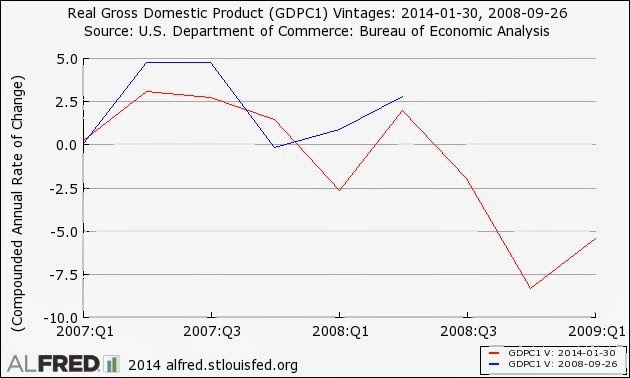 They expected the economy to grow slowly in 2008 and then more quickly in 2009. The Times also put together a fantastic interactive graphic linking quotes from the meetings to the events of the year. This is already a historic week, and the week has just begun. The labor market is weak and getting weaker. The unemployment rate has risen 1.1 percentage points since April and is likely to rise further. I am not convinced that the unemployment rate will level off where the Greenbook is assuming currently. The failure of a major investment bank, the forced merger of another, the largest thrift and insurer teetering, and the failure of Freddie and Fannie are likely to have a significant impact on the real economy. Individuals and firms will become risk averse, with reluctance to consume or to invest. Even if firms were inclined to invest, credit spreads are rising, and the cost and availability of financing is becoming more difficult. Many securitization vehicles are frozen. The degree of financial distress has risen markedly. Deleveraging is likely to occur with a vengeance as firms seek to survive this period of significant upheaval. Given that many borrowers will face higher interest rates as a result of financial problems, we can help offset this additional drag by reducing the federal funds rate. That said, in my anecdotal interchanges, I am still hearing about the likelihood, as I think President Pianalto mentioned, that people are seeking to preserve their margins. They’ve been stung for many years, and I’ll just give you one case because I think it tells us something. If you talk to the CEO of Wal-Mart USA, what they are pricing to be on their shelf six to eight months from now has an average price increase of 10 percent. Now, of course, you might have this reversed as we go through time. My biggest disappointment, incidentally, was that the one bakery that I’ve gone to for thirty years, Stein’s Bakery in Dallas, Texas, the best maker of not only bagels but also anything that has Crisco in it, [laughter] has just announced a price increase due to cost pressures. It is easy, with the benefit of hindsight, to criticize the committee members whose worries over inflation and optimism about the impact of the financial crisis look so foolish today (and this applies to some of the academic members, not just Fisher). But looking at the data they had at the time underscores the fact that their task isn't so easy. That's a German word that means "method war" and it came to mind reading Simon Wren-Lewis' post last week, "Are New Keynesian DSGE Models a Faustian Bargain?" The reason they might seem so is the methodological underpinnings of DSGE (Dynamic Stochastic General Equilibrium) models, which are "micro-founded" macroeconomic models derived from the optimizing behavior of individuals (or, often a "representative agent") were brought into macroeconomics by Robert Lucas, Ed Prescott and others who were seeking to overturn "Keynesian" macroeconomics (see, e.g., Lucas and Sargent, 1979, "After Keynesian Macroeconomics"). The first generation of models of this type - "Real Business Cycle" (RBC - where "real" means non-monetary) implied that economic fluctuations could be optimal, and that monetary and fiscal policy were either useless or harmful (this JEP article by Charles Plosser is a good primer). While these models failed to convince as explanations of economic fluctuations overall (as Larry Summers explained, though they can still be a useful part of the macro toolkit, as Chris House argues), the methods introduced by the RBC theorists have become nearly universal in macroeconomic modelling under the broader moniker "DSGE". The last couple of decades have shown us that a number of "Keynesian" features, such as "sticky" prices can be incorporated into such models, which then go by the name "New Keynesian." So the "New Keynesians" are using methods that were introduced by a cohort of macroeconomists that were explicitly anti-Keynesian. That is, Lucas et al. won the methodological war about how to build macroeconomic models, but their anti-Keynesian view of the economy itself did not prevail. Wren-Lewis’s answer is no, because New Keynesians were only doing what they would have wanted to do even if there hadn’t been a de facto blockade of the journals against anything without rational-actor microfoundations. He has a point: long before anyone imagined doing anything like real business cycle theory, there had been a steady trend in macro toward grounding ideas in more or less rational behavior. The life-cycle model of consumption, for example, was clearly a step away from the Keynesian ad hoc consumption function toward modeling consumption choices as the result of rational, forward-looking behavior. But I think we need to be careful about defining what, exactly, the bargain was. I would agree that being willing to use models with hyperrational, forward-looking agents was a natural step even for Keynesians. The Faustian bargain, however, was the willingness to accept the proposition that only models that were microfounded in that particular sense would be considered acceptable. It’s one thing to accept that models with an Euler condition at their core can sometimes be useful; it’s quite different to restrict your discourse to models with that characteristic, while ruling out everything else. Politics: Both the academic sort in terms of who gets hired and what gets published - as Krugman alludes to, some of it was pretty vicious (at least that's my sense - this was all well before my time) and some are still holding grudges - and the political implications of the theory. In its purest form, RBC theory has some pretty right-wing policy implications (though RBC macroeconomists are not necessarily Republicans), so some view RBC (and, by extension, DSGE) models as cover for a conservative political agenda. How academia works: Publishing papers requires at least some incremental degree of novelty (i.e., a journal article must make a "contribution to the literature"). While the events of the last six years have underscored the usefulness of the standard textbook Keynesian approach I (and many others) teach our intermediate-level macroeconomics students, as far as publishing it, well, it was done 77 years ago. While it is useful for policymakers and the economists working in policy institutions, academic economists are going to focus on developing new theory - which hopefully leads to better policy-making, in the long-run at least. That is, the divide between "scientists" and "engineers" described by Greg Mankiw applies. For more interesting thoughts on this see: Brad DeLong, Roger Farmer, Steve Williamson's response to the Krugman post quoted above, another post by Krugman.